There is a growing and passionate community around osquery, actively sharing information and perspective, answering questions, exposing challenges and dispelling misconceptions. Even so, learning the basics as you're getting started requires a lot of piecing together bits of wisdom (ie Googling + Reading + Networking). The intention of this post is to a) curate some of the great content from the community b) organize it to cover common questions for beginners c) incorporate some of what we've learned over the past three years through the Uptycs journey. If you like it, and it is helpful, throw a comment down below or let us know on Twitter and we'll create a more advanced FAQ next time around. Osquery is a universal endpoint agent that was developed by Facebook in 2014. It is an active and growing open source project on GitHub, with 230 contributors and over 90 releases to-date. According to the official osquery docs, osquery (os=operating system) is an operating system instrumentation framework that exposes an operating system as a high-performance relational database. Using SQL, you can write a single query to explore any given data, regardless of operating system. This is a unique approach in the security landscape, creating one agent for many operating systems, leveraging a standard query language instead of creating a proprietary one, and collecting rich data sets which have broad applications. Osquery represents a fundamental rethinking of the fragmented, siloed approach plaguing the security industry today. How you’ll analyze the data - i.e., what problems are you looking to solve? What questions do you need to ask? This often leads to a build vs buy analysis. See the section below, "what are osquery pros and cons?" for additional considerations. Currently, osquery supports OS X (macOS), Linux, FreeBSD, and Windows. Osquery can also monitor and extract data from Docker containers. One of the most powerful features of osquery is its ability to collect and normalize relational data independent of operating system. Because of the subtleties that exist between platforms, with other agent based solutions, users are often forced to write (and maintain) scripts to extract related information - an approach that quickly becomes a barrier to scale. Osquery solves this by exposing operating system information as normalized SQL tables. In other words, users now have the ability to ask the same questions, to get the same type of answers, regardless of operating system. What tables does osquery support? What type of data/information can I get from osquery? How much data is osquery collecting on average per endpoint each day? Where is this data stored? We’ve observed osquery generating an average of 110mb of data per endpoint, per day. Of course, your mileage may vary depending on the monitored assets function, and what data is being collected. What is a query pack? What are some pros and cons of osquery? exposes them to new endpoint data to which they never before had access. 1) Cost of data storage can be high - for example, Elastic is 3x the cost of the bytes transmitted from osquery. On average, 110mb are transmitted from each endpoint per day. 2) Translating the incremental data is hard - making sense of the information for vulnerability management, threat investigation, compliance and audits, etc. is quite complicated and requires more heavy lifting than initially anticipated. 3) Optimizing queries and query packs is critical - building your own query packs can have an impact on computing resources. Often times, a query will pull far more system data than anticipated and this can cause systems to crash, yet testing and optimization before deployment is taxing, and in some cases, not possible. 4) Third party data is still needed - For threat or intrusion detection, integrated third-party data sets are still needed. For a more technical perspective on some of the current challenges, watch this video from QueryCon 18 where Teddy Reed, Facebook Security Engineering Manager, shares what keeps him up at night with osquery. 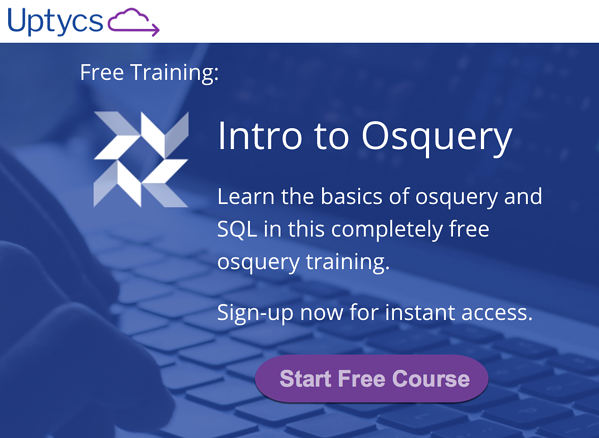 How do I get started and install osquery? How you’ll analyze the data - i.e., what problems are you looking to solve? Download from osquery.io - you’ll find macOS, Linux, RPM, Debian and Windows versions (you may find you need to customize your configuration). For example, here is a post from Joshua Brower at Defensive Depth that walks through Custom MSI Configs. We’ve created a few handy videos that walkthrough various installations over on YouTube. Build It: You can build an end-to-end solution yourself, pairing other open source and commercially available products with some custom developed functionality if time, cost, and resources aren’t limiting constraints. This post from Chris Long of Palantir provides a comprehensive playbook of how they constructed a solution for rapid incident response. 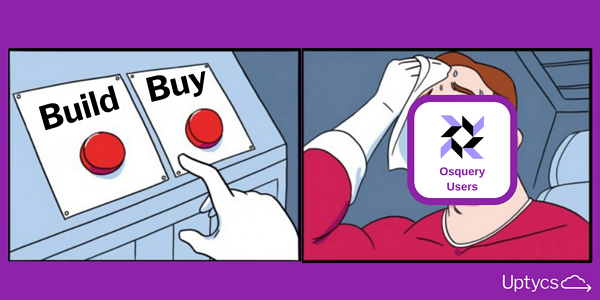 Buy It: You can sign up for a Free Trial of Uptycs - this will enable you to deploy the necessary versions of the osquery agent. You’ll also have access to the Uptycs security analytics platform which collects, aggregates, and analyzes osquery data for fleet visibility, intrusion detection, vulnerability management, incident investigation, and audit & compliance. How do I ask questions or extract information from osquery? Using SQL (Standard Query Language), and an understanding of the osquery tables where the data you require is stored, you can construct commands that return nearly any piece of information you desire about a single endpoint where osquery is running. Here is an overview of how to construct some of the most common SQL queries for osquery. If you want to query many (or all) of your endpoints at once, you’ll need additional instrumentation and a data store for aggregation across your infrastructure. What are some basic SQL commands I need to know? Many engineers and developers have used SQL before, but still find a refresher helpful. We also hear that the way SQL is applied and optimized for osquery is slightly different than how they used or applied SQL before. For example, joining tables, using count or limit functions and filtering results are popular given the volume of fleet wide data you’ll be working with in osquery. Two of the most common and basic queries are select * from uptime; and select * from users limit 5; check out this post on SQL introduction for osquery to learn more common queries and how to join tables, filter results and more. Have another question we can help answer? Know of a great resource we should include? Let us know in the comments below.